(BOSTON) — For the first time, scientists can accurately measure population growth rates of the microbes that live inside mammalian gastrointestinal tracts, according to a new method reported in Nature Communications by a team at the Wyss Institute for Biologically Inspired Engineering at Harvard University and Harvard Medical School. The new method uses genetically modified fluorescing E. coli cells to measure microbial growth rates, and works very much the same way as the “mark and recapture” practices that ecologists have long been using to estimate population levels of animals in the wild. The programming of E. coli to count gastrointestinal microbe growth rates is another advance for the field of synthetic biology, which largely aims to harness and re_wire cellular machinery for carrying out specific functions via genetic and metabolic engineering. The Wyss and HMS team is calling the method “distributed cell division counting”, or DCDC for short. Gut microbes – which collectively contain a vast amount of genetic information known as the “microbiome” – play hugely important roles in the lives of their hosts. These microbes undergo dynamic shifts in their rates of growth depending upon factors like host diet or the presence of antibiotics. Gaining a window into these fluctuating dynamics helps scientists understand how microbes grow and divide inside our guts during infection, antibiotic therapy, and other microbial imbalances caused by health issues such as irritable bowel syndrome, obesity, and cancer, which could help identify future therapies for treating these conditions. But in gastrointestinal microbiome research, an area rife with new discoveries and opportunities thanks to recent breakthroughs in our understanding of how influential these microbes are to our health, it has until now been very difficult to monitor microbial cells during their travels through mammalian gastrointestinal tracts. Microbial growth rates fluctuate in response to diet, wellness, exercise and the environment, and are affected by inter-organism competition inside the gut. Yet after entering the gut and before exiting, microbes pass through the “dark zone”, where they cannot be accessed or analyzed using standard methods and without disrupting observation of natural conditions. That challenge inspired Cameron Myhrvold, a Hertz graduate fellow at the Wyss Institute and Harvard Medical School and the lead author on the new study, to work with Silver to develop the novel synthetic “mark and recapture” technique known as DCDC. Using a genetically engineered red-colored fluorescent protein controlled by a gene expression promoter as a visual flag, Myhrvold set out to quite literally mark and recapture E. coli, which are extremely common bacteria found in all mammalian guts. The DCDC strategy – in which mice were fed the genetically engineered microbes and then their waste collected for analysis – enabled the team to precisely count the bacterial cell divisions that occurred inside the mice’s gastrointestinal tracts. 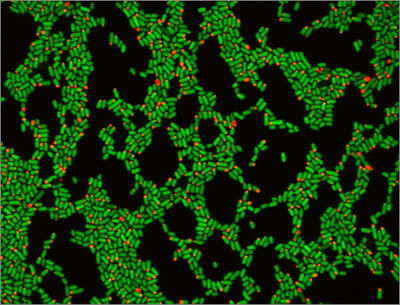 The fluorescing protein “marked” the first generation of E. coli introduced to the gut and therefore allowed the team to calculate the population dynamics by analyzing the proportion of fluorescing cells versus the entire population of cells collected after their “recapture”. A major new finding resulting from the study is that initial E. coli cell death in the gut plays a key role in the long-term survival of those E. coli populations and helps them persist against competition from other microbial strains, which was surprising to the team. Using a mathematical model developed from their experimental results in mice, the team determined that while initially many microbes die upon entering the gut, over time their growth rate stabilizes as they adapt to the gut environment. The DCDC method, which could be adapted to monitor a wide range of microbes, could be applied broadly in gastrointestinal research to illuminate what happens in the “dark zone” of mammalian guts when diet, environment, and health conditions change or experimental interventions are introduced. “This innovation could help us gain a better understanding of the microbes that comprise the microbiome, which live inside us and contribute so significantly to our health. It also is a harbinger of an entirely new class of ‘cellular devices’ – literally comprised of living cells – which can be programmed to sense and respond at will,” said Wyss Institute Founding Director Donald Ingber, M.D., Ph.D., who is also the Judah Folkman Professor of Vascular Biology at HMS and Boston Children’s Hospital, and Professor of Bioengineering at the Harvard John A. Paulson School of Engineering and Applied Sciences. Genetically engineered E. coli containing a fluorescing red protein enabled a Wyss Institute and Harvard Medical School team to analyze the population fluctuations of gut microbes by comparing proportion of “marked” to “unmarked” cells.